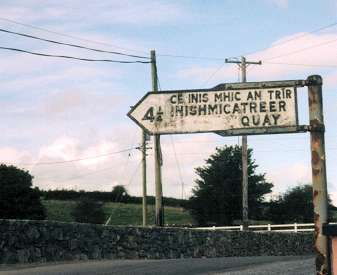 Inis Mhic a'Trír (Inishmacatreer) "the island of the son of the three" is an island in Lough Corrib. According to my cousin, Sonny Daveron, " Sure it's the loveliest place in the world to live in and for that matter die in", and Patricia and I certainly need no convincing. 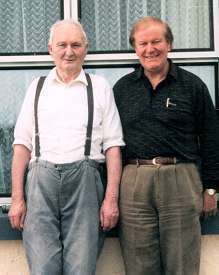 We first met the Daverons in 1986 when we called to tell Sonny that my father was unwell and wasn't expected to survive. Though Dad and he were always the best of friends, I had not ever met Sonny or any of his family. For as long as I can remember, I have wanted to visit the Island and the the Daverons about whom Dad had spoken so often. If you have already read the script of my taped chat with Dad when he and Mam visited Australia in 1997, you are aware of the warmth and enthusiasm with which he spoke about them. 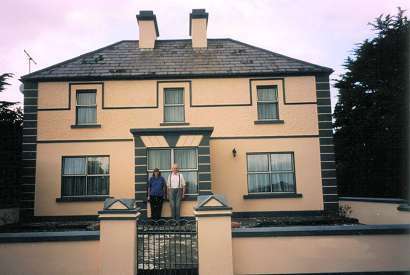 My paternal grandmother, Mary Daveron, was born here in 1869 to Pat and Margaret (Holleran) Daveron, and her nephew, Sonny, whom I have visited a number of times since 1986 was born here on the 9th January, 1920. He married Mary Delia Casey on the 6th July, 1944. I last visited Sonny and his family as recently as 2002. Margaret Holleran's brother was the grandfather of Tommy Holleran of Cahermaculick. I have always known that my father and Tommy Holleran were related but didn't realise how until I met Sonny Daveron. Tommy's son Paddy Holleran, my own third cousin, still lives there about two kilometres from the Coleman home. 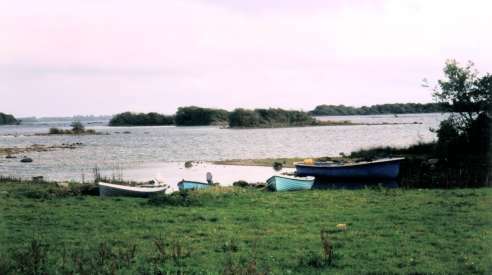 As well as being keen farmers, Sonny and his father, Pat, were proud of their reputation as boat builders, producing small to medium sized wooden boats. Three of the four boats in the picture were built by Sonny. In the summer of 2001, Tricia and I had the pleasure of travelling in one of the boats with Sonny's son, Jarlath, to a couple of the larger neighbouring islands to check on stock grazing there. 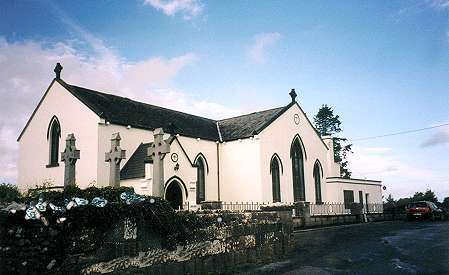 St. Mary's Catholic Church Claran on the road from Inishmacatreer to Headford. It was here back on the 25 May, 1901 that My grandfather, John Coleman from Turloughmore, married Mary Daveron from the Island of Inishmacatreer. 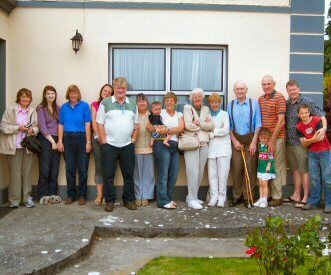 During the Clan Coleman Reunion in 2004, we arranged to call to the Island of Inishmacatreer to visit our cousins. Since 1986, Patricia and I have visited a number of times during our trips to Ireland and on each occasion I have learned something new about my grandparents who had died some five years before I was born. As Sonny knew his first cousins, Jim and John Coleman, well, this was an excellent opportunity to introduce their sons and daughters to him. Sonny looked forward to the meeting and was delighted to be able to talk to them about their parents. He appears with his walking stick in the photos. 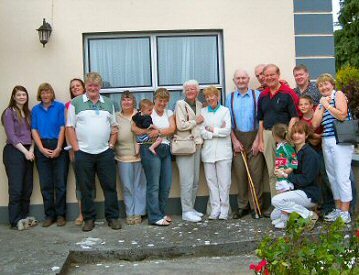 Others in the photo (left) are, from L to R, Patricia Coleman, Geraldine Daveron (Sonny's Grand-daughter) & Pauline (Sonny's Daughter-in-Law), Clair Timms, Patrick & Barbara Coleman, Max Timms in the arms of Linda Downie, Martha Caluori and Mary Meehan, Sonny Daveron, Mick Coleman & Roisin Naughton, Kevin Meehan and Jack Downie. In the photo on the right, we have Colette Devcich with the same group. Consider the craftsmanship required to make such a fine and durable wooden boat as this one in the picture below. Needless to say, Sonny Daveron is very proud of this boat which was the last one he made and sadly the last to be made on the Island since the arrival of the aluminium and fibreglass ones of all shapes and sizes. As our party bid farewell to Sonny and his family, he handed me a parcel which I was not to open until I had left the Island. I won't ever forget that moment. It was a very moving one. I could sense that Sonny was parting with something he held so very dear and special, something that was part of him, something he wanted me to have. It was the first and only photo, beautifully framed, of this finely crafted wooden boat, his and the Island's last great work.of art. When we met at the Anglers' Rest Hotel in Headford for the Clan dinner on Sunday 8th August, we were I'm delighted to say joined later in the evening by our Daveron cousins, Anne and Gerald O'Connell, Jarleth and Pauline Daveron and Mary Barry.